I believe that this video format has significant advantages over alternatives like .MOV or .MP4 and that recent industry moves will accelerate its adoption. MXF stands for Material eXchange Format and as production workflows become more complex, a versatile container format that can be used from capture to post-production is exactly what professionals want. MXF isn’t exactly a new container format for us: Back in 2008, DVCPro HD was a very popular recording format, and most of the time we had to deal with MXF damaged files. But for a format standardized over a decade ago, this has been a very slow start. Recently, the success of XDCAM HD422 camcorders like Sony PWM-200 and of Canon XF products like Cinema EOS C300 has given MXF a promiment place in professional workflows. Ageing of QuickTime .mov container and Apple missteps with Final Cut X have also helped. A few months ago, I started to receive requests to repair footage from new Sony CineAlta F5. This 4K cinema camera uses a new format called Sony RAW, which is recorded in MXF files. Final Cut has lost share in postproduction world, so many people is now in 100% Windows set-ups where QuickTime files are not very friendly, whereas MXF is first class citizen in AVID and Adobe Premiere. In 4K and Cinema productions, where workflow is king, end-to-end processing including color grading simply cannot be done without MXF source files. So what significant advantages will make MXF win? MXF is a verbose and redundant format, which makes it more robust and easier to repair than MOV or MP4. That’s a strong advantage for professionals. At Aero Quartet, it’s always a pleasure to work on corrupt MXFs, because we know that we will be able to provide a repaired video with same quality as original. 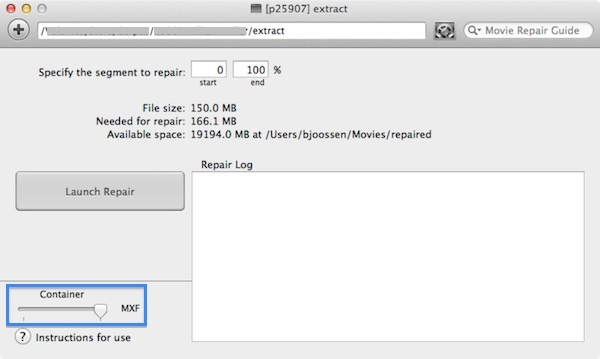 Treasured can detect and preview video inside unplayable or recovered MXF files. DVCPro HD, IMX, Sony RAW, Sony XAVC, XDCAM, Canon XF and other formats supported. For the more technically inclined, we explain how MXF is internally organized to provide robustness. MXF can be used from capture to post-production. The big advantage is that all metadata “travels” inside the MXF files from beginning to end of workflow, which saves a lot of headaches to all the production and post-production crew. The full metadata is embedded in every single frame. Again, this is the correct way to do it. Compare that to XDCAM EX that uses separate BIM, PPM, and XML files that can easily get lost in the process. Example: We have used MXFDump to display the IndexTableSegment of a Sony XAVC file in MXF format: The last component of each frame is Metadata. This means that we can retrieve Timecode, Aperture, and many other video parameters from every single video frame. MXF is an open standard promoted by the video industry. That’s a guarantee that a single vendor cannot and will not play dirty tricks. MXF is being adopted on its own merits, is being developed based on industry needs, and there is no risk of vendor lock-in like with proprietary formats. As Digital Cinema and 4K production are taking off, MXF is the natural choice from most software and hardware vendors because it’s a competent and extensible format. To make a computing analogy, I would say that MXF is the 64 bits era format, ready for the next 20 years, whereas QuickTime MOV, designed in the late 80s, is the 32 bits era format that starts to show significant limitations.